For indoor and outdoor use. New interchangeable color panels (red & blue) included. 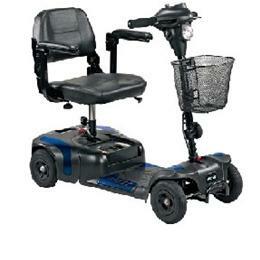 4 wheel model allows for 44" turning radius and added stability. Convenient , compact design makes assembly/disassembly easy. Easy to assemble and disassemble with 4 pieces Comes with easy to remove wireless battery that can be charged separately from the scooter. Comes with headlight. New "Finger-pull" throttle. Comfortable height adjustable, upgraded seat. Flip back adjustable width arms. Speed ranges from 5 mph to 4 mph and a cruising range of up to 15 miles. Stackable battery box will allow an optional battery for increased range up to 30 miles. Comes standard with anti tippers. Convenient free-wheel release knob. Flat free tires. Large carry basket. Easy to adjust tiller. For added safety the tiller has an auto straightening function. Has been tested and surpassed the ANSI RESNA testing requirement. 70 amp drive CTE electronics. 300 lb. Weight Capacity.